Download “Finding Our Voice, Regaining Our Majority” (28-page PDF). He is exactly right. In much of the country the Democratic brand is toxic. Since Reagan, conservatives have done a remarkable job of defining liberals and Democrats for the public as tax-and-spend, weak-kneed, anti-American, abortion-loving, godless libertines. Worse yet, Democrats have let them get away with it, with no real rhetorical counterattack against conservatives. The results have been disastrous. Conservatives now control all three branches of national government-the presidency, Congress, and the Supreme Court-along with three-fifths of state legislative houses and governorships across the country. Curiously, while voters are soundly rejecting Democratic candidates, they’re not rejecting Democratic policies. Poll after poll shows that a majority of voters agree with Democrats on many major issues, from health care to climate change to immigration. That can mean only one thing: Democrats have a serious image problem. Voters simply don’t like Democrats. They have no idea who they are, what they stand for, or how the party plans to help them. Democrats desperately need a new message, and they shouldn’t underestimate the mountain they have to climb. Restoring their image will take an enormous marketing, advertising, and communications campaign. It can be done, but Democrats need a plan. Luckily, we happen to have one. These are the values Democrats stand for. Democrats fight for workers and the poor. Democrats are the party of reform and clean government. “Finding Our Voice” justifies and outlines each of these messages and gives specific examples of how Democratic politicians and spokespeople can incorporate them into every political discussion. The paper also offers a three-step plan of action for communicating them to the public. Create a vision: Democrats must tell voters what they stand for. They must help Americans visualize exactly how Democrats will make their lives better. The party needs to create a formal mission statement of Democratic values and lay out a specific agenda for helping Americans: tax cuts for the middle class, raising the minimum wage, guaranteed sick pay, affordable college tuition and child care, and so on. Launch a branding campaign: Democrats need a major marketing and advertising campaign to rehabilitate the party’s image. TV, radio, and print ads should focus not on specific candidates or issues but on Democratic values and accomplishments. In a future post we’ll show exactly how that can be done. Speak with one voice: The Democratic Party needs a strong, centralized messaging strategy, so that Democrats everywhere know how to communicate our common values and talking points. In a coming post, we’ll offer ideas on how that can be accomplished. Democrats have an amazing story to tell. 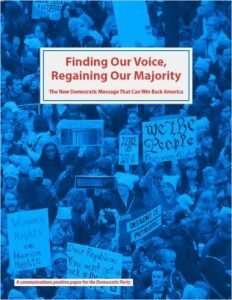 We hope party leaders will take a look at “Finding Our Voice” and reimagine how Democrats communicate with America.